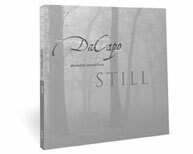 DaCapo’s debut CD STILL has received a tremendous amount of critical acclaim. STILL is available to purchase through all major online music vendors, including iTunes, Spotify, Google Play, and more. Simply search DaCapo Still. You can also order a CD by mailing a cheque for $20 (plus $3.50 shipping), payable to the DaCapo Chamber Choir. contemporary chamber group in Montreal. Stephanie Kramer is the voice instructor at Conrad Grebel University College and a member of the Tactus Vocal Ensemble. John Helmers is the Principle Cellist of the Kitchener-Waterloo Symphony and a member of the Canadian Chamber Ensemble. Recorded in The Chapel of St. Margaret and St. John, St John’s-Kilmarnock School, Breslau, Ontario. This CD was recorded using 24-bit technology for high-definition sound.